ARK CITY, Utah — Any coach in college athletics will tell you that recruiting is far from a perfect science, and there’s no better evidence than Cooper Kupp. 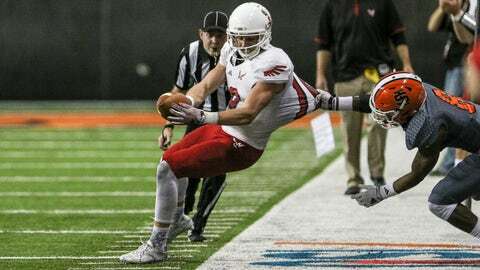 An All-American wideout at Eastern Washington, Kupp may be the best college player in the country, to say nothing of his place in FCS history. A rising senior, Kupp has already caught more passes for more yards and more touchdowns than Jerry Rice — and has done so in two fewer games. And by the midway point of this season, he should hold every major FCS receiving record there is. But coming out of high school in Yakima, Washington, Kupp wasn’t just overlooked by the major FBS programs that dot the Pacific Northwest. He was hardly on the radar for anyone, at any level. That the 6-foot-2, 208-pound Kupp wasn’t pursued by every program on earth is clearly a massive oversight, and with the benefit of hindsight, any recruiting coordinator worth his title knows they should have been knocking on his door. Even so, it’s almost implausible that a player of Kupp’s caliber could fall through the cracks. Fortunately for those misguided coaches across the country, Kupp has a plan to make sure it never happens to anyone else again. An economics major with a minor in business administration, Kupp owns a 3.62 GPA and might be as bright in the classroom as he is talented on the gridiron. And during his time on the Eastern Washington campus in Cheney — pronounced CHEE-nee — he’s taken a particular interest in the study of what he calls econometrics. "It’s similar to the ‘Moneyball’ stuff," says Kupp, referencing the 2003 Michael Lewis book and 2011 film, as he watches TV in his hotel room on the first day of Big Sky media days outside Salt Lake City. "It’s the measurement of efficiency, putting labels on things and seeing, ‘How much does this variable effect this dependent variable?’ And in doing that, you can put together some really interesting models." One of the models Kupp has created was inspired, knowingly or not, by his own experience as an undervalued high school star. In it, Kupp takes 30 different figures available for any high school player and plugs them into a formula. The formula then crunches the numbers and spits out a result that predicts how productive that player will be in college. Some of the variables Kupp’s model considers are predictable — height, weight, speed, on-field stats — but others, like hair color or the enrollment at a player’s school, are perhaps less obvious. "Typically kids with dark-colored hair mature faster than those with light-colored hair," explains Kupp, who is blonde. "So if you have a guy with dark-colored hair and a guy with light-colored hair and they both perform the same at the high school level, do you want to take the guy who has already developed all the way or the one who hasn’t? Kupp readily admits that his model is far from perfect, and he’s constantly tweaking the algorithm to get it just right. But someday — hopefully after a long NFL career — he says he’d like to market the product to programs across the country to improve their approach to recruiting. He’s also begun to develop a model that projects draft position for college players. But as Kupp dives into the minutiae of the draft-position experiment, which he says he did for fun, I stop him to pose a question: Have you ever projected your own college career through your high school-to-college model? "Yeah, I did," Kupp says, almost shyly, trying to hold back a knowing smile. On the surface it would appear that Kupp was born to play professional football on account of his genetics alone. His father, a quarterback, was a fifth-round draft choice of the New York Giants in 1990 and also spent time with the Cowboys and Cardinals during a brief stint in the NFL. And Saints fans will recognize Jake Kupp, Cooper’s paternal grandfather, as a Pro Bowl left guard who spent the majority of his 12-year career in New Orleans, starting in the franchise’s inaugural season in 1967. "Growing up I knew they’d both played, but it was kind of interesting, because if you go and hang out with my grandpa, you’d see his trophies in the basement or his Saints helmet up on the shelves, but he just never talked about that kind of stuff," Kupp said. "It was never something that we heard from him, or even my dad. You had to force them to talk about it. "I think that’s just the kind of people they are," he continued. "They’re not defined by what they’ve done and where they’ve played. It wasn’t NFL quarterback Craig Kupp and NFL guard Jake Kupp. They were just Dad and Grandpa." Additionally, Kupp’s mother, Karin, a personal trainer, played soccer at Pacific Lutheran University, where she and Craig are in the school’s athletic hall of fame. Karin’s father, Tom Gilmer, was also a former PLU quarterback and longtime high school football coach in Tacoma, and Cooper’s great-uncle, Jeff Kupp, played O-line at Eastern Washington in the 1980s, as well. But early on in his own career, Kupp’s size was limiting, if not completely prohibitive, when it came to his goals on the field. "My freshman year, I was 5-foot-4 and 115 pounds when I first weighed in," Kupp said of his introduction to the football program at A.C. Davis High School in Yakima. "I remember because I was wearing ankle weights, so I was probably more like 112. But if you were to ask me then where I was going to be in four years, I still would have told you I was going to play at USC. "That was just my mindset," Kupp continued. "I never had a doubt in my mind that I was going to play football at the next level, and not just play, but play at a big time school." Fortunately for Kupp, his father and grandfather were also late bloomers and impressed upon Cooper the importance of mastering his position early, before the growth spurt they knew would someday come. "When he was young, playing Grid Kids, he stood out as an athlete, but around sixth or seventh grade, the other kids just took off and had these phenomenal growth spurts, and Cooper just kind of stayed where he was," Jake Kupp said of his grandson. "And I remember just how frustrating that was for him, because size-wise, it was very difficult for him to compete with the other kids. So he was just one of the kids at that time, but he had this desire and this passion to be better." "We developed the same way that Cooper did, so we knew he would get there eventually," Craig Kupp added. "We had lots of conversations about getting footwork down and working on fundamentals and understanding the game so that when you do get your body, you’re going to leapfrog folks. You’ve got to have that base, and then the speed and athleticism will be there later."
As a sophomore, Kupp made the varsity team at Davis, and while his numbers weren’t yet eye-popping — he caught 19 passes for 230 yards his first season — his dad saw a talented, if awkward, player that was primed to make a statement. "I just remember, as a sophomore, it was so funny to look down there," Craig Kupp said. "Because he was one of those guys with long legs, but his number was halfway tucked into his pants. "He’d go to the summer camps and he wouldn’t stand out from a physical standpoint, but he was a real good, precise route runner," he continued. "And when the field work would start, at least to me, he was light years ahead of most of the kids from a technical standpoint. But for some reason it didn’t translate. It didn’t capture the attention of the coaches that were there." As a junior, Kupp became a key deep threat for the Pirates, catching 31 passes for 811 yards and seven touchdowns, but even a breakout season did little to change the way he was viewed at the next level. "To be frank, he was the skinny white kid from Davis who had good hands," said former Davis offensive coordinator Jay Dumas, now the receivers coach at Central Washington. "He didn’t look like a Division I football player. I’ve seen kids over the last 20 years going to summer camps, and you can kind of tell the body types that are getting recruited. But Cooper, when he was a junior, he didn’t look like them. He looked like a Division II, Division I-AA recruit." So Kupp made it his singular goal to be even better, and as a senior he reeled in 60 catches for 1,059 yards and 18 scores, leading Davis, once a perennial doormat, to a second straight winning season for the first time since the late ‘60s. He’d also grown to be 6-foot-1 and 185 pounds, and in 2011, the Seattle Times named Kupp one of the top 100 recruits in the state. But Kupp still struggled to catch the eye of college coaches, despite the fact that his family hired a recruiting service to help get his name on someone’s — anyone’s — board. Jake Kupp, a Washington grad, also tried to use his connections at his alma mater to help, even reaching out to Steve Sarkisian directly to plead his grandson’s case. Yet when Kupp walked off the field following his final high school game, he did so without a single scholarship offer in hand. "My goals were set to have more opportunities," Kupp said. "So it was tough going through that season and not having concrete proof that there is something for you at the next level. "We couldn’t get anything back from these coaches," he added. "Not even a note saying, ‘Hey, we took a look, but sorry, it’s not going to work.’ We couldn’t get anything, and when you’re going through that it’s kind of disheartening." Thankfully, Kupp had a wild card in his offensive coordinator, Dumas. 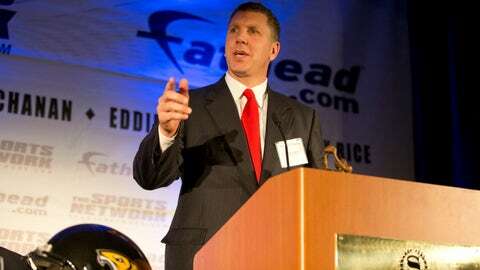 One of Dumas’ former teammates at Curtis High School in Tacoma was Eastern Washington head coach Beau Baldwin, and throughout Kupp’s high-school career Dumas, a former Washington State wide receiver, tried to get his old pal to take a serious look at his latest find. "I remember early on, he said, ‘Hey, I’ve got this young kid, and I’m telling you, down the road,’" Baldwin recalled of Dumas. "He was already seeing it when it wasn’t necessarily the easiest thing to see. "So we saw him in football camps and kind of saw how he moved and how he did things and, it was like, ‘Hey, who knows?’" Baldwin continued. "But then as he started to grow into his body and we got to watch him as a junior and a senior and got to be around him, we saw some of the little things and the intangibles that when you didn’t get a chance to truly be around him, you may not see." Particularly, Baldwin and the Eastern Washington staff were impressed by the effort Kupp put into learning the Davis offense. "I remember many days after practice, before practice, watching film with Cooper like he was an assistant coach," Dumas said. "I literally leaned on him for ideas, for things that he felt good about. And the amazing thing with Cooper was, if we were watching film together, he rarely watched film in terms of what he was doing. He always watched film in terms of what we were doing so he understood exactly how the offense was running and what we were trying to accomplish." "Those were things that we valued," Baldwin added. "So we thought, ‘Hey, he may be a little under-recruited, doesn’t come from a football factory, ran a bad track time’ — these were things in our favor that gave us a chance to recruit this kid that probably wasn’t going to get recruited heavily." It was three weeks after that final game when Kupp, also a three-year letter-winner and state champion in basketball, got a call from Baldwin during basketball practice offering a partial football scholarship to Eastern Washington. Soon after, Idaho State joined the bidding with a full scholarship offer, and a short time later, Baldwin matched it. Kupp then paid a visit to both schools and ultimately decided to go with Eastern Washington, a perennial power one year removed from an FCS national championship. "At the time, Idaho State was not a great team, and they had been struggling," Kupp said of the Bengals, who showed promise during the Jared Allen years, but went a combined 4-40 during Kupp’s time at Davis. "But really, it was the relationships I had at Eastern. I visited Idaho State first, then visited Eastern, and once I was at Eastern I knew it was the right place."
And while some in Kupp’s position may have viewed signing with Eastern Washington as settling, that was never Kupp’s approach. "Coop didn’t feel overlooked," Dumas said. "He didn’t look at it like, ‘I’m better than that guy that’s going to that school.’ He was genuinely happy to have a scholarship to go play Division I football and go get an education, and I think that helped him when he got there. He didn’t get there thinking that he should have been somewhere else. When he got to Cheney, he was home." Simply earning a scholarship wasn’t enough for Kupp, however. He still had NFL aspirations and knew he had to make the most of his time as an Eagle to make them a reality. But almost immediately after arriving on campus shortly after his 19th birthday, Kupp and his coaches were met with the dilemma of what to do with his freshman season. At the time, Eastern Washington boasted a trio of accomplished veteran receivers in Greg Herd, Brandon Kaufman and current Eastern Washington receivers coach Nick Edwards. Initially, Kupp hoped to play right away, but it soon became clear that snaps and targets would be limited if he did, making the prospect of taking a redshirt likely. "I’d been playing football for however long it was, nine years, 10 years, so the thought of not being able to go out and compete for a year was tough," Kupp said. "But in my head, I was going to treat it as if I was playing on Saturday either way. So I took that fall camp and said I was going to make the coaches have a tough decision by the end of it." Over the next few weeks, Kupp did just that, and eventually his coaches left the decision up to him, although they encouraged him to consider sitting out for the sake of his own development. "When he got to campus, he outplayed Brandon, Greg and Nick, and they were all All-Americans and 1,000-yard receivers at one point in their career," said Boise State receivers coach Junior Adams, at the time the receivers coach at Eastern Washington. "So I was kind of left with the dilemma of whether to play this kid or redshirt him. "Now I say I’m the one that ended up redshirting Cooper Kupp," Adams continued with a laugh. "But honestly, looking back, it was probably good for him and his career." It also turned out to be quite the coup for Eastern Washington. With Kupp on the sidelines, Eastern Washington went 9-2 during the 2012 regular season and reached the semifinals of the FCS playoffs, where it lost to Sam Houston. Kupp, meanwhile, was named the offensive scout team player of the year and impressed the coaches with his commitment to preparation. "From a mindset standpoint, he was going to play as a freshman, and if not, he was going to act as if he was," Craig Kupp added. "He’s just that kind of guy. He’s always doing extra stuff, but it’s not extra to him. It’s just what you should be doing." And in keeping with the lessons he learned growing up in a football family, Kupp made a conscious effort to be as coachable as possible. "People always say they’re mentally tough, but he defines it," Adams said. "You can tell him something once and he’ll be able to correct it, and he just does a really good job of self-evaluating and really being critical of his game or how he runs his routes. He’s very, very detailed. Some people like details, but he loves details, and you don’t find many kids at that age that have that type of mindset or that type of head on their shoulders." Kupp also took a particular interest in learning everything he could about his team’s playbook, just as he did at Davis. "I want to know the entire offense," Kupp said of his approach. "I want to know what everyone is doing on every play, all the way from protection to tailback to progressions of quarterbacks. I want to understand plays, and because I understand plays better, I’m able to play the game faster and more efficiently. And I think that was one of the things that set me apart."
"I tease him about it, like, ‘I think Cooper has a problem, I think Cooper has OCD with football,’ but it’s benefited him because he doesn’t want to leave any details unnoticed," added Dumas. "He’s not watching film and studying to brown-nose. He’s watching film and studying because he really gets off on it, almost like he gets a football high by knowing exactly what everyone is doing." As a result — and thanks to his physical growth in the weight room — Kupp was at the top of the Eagles’ depth chart when his redshirt freshman season began. But still, there were questions as to how his skills might translate on Eastern’s bright red field. "It was kind of like nothing changed, just the same thing all over again," Kupp said. "People don’t have high expectations of me, but I’m not trying to be the best I can be for them. I just want to be the best me I can be and know that that’s going to be enough." Any lingering doubt was erased, however, in Kupp’s first game, as he hauled in five catches for 119 yards and two touchdowns during the first two and a half quarters of a 49-46 win at Oregon State. (He left the game after cramping up in the third.) Two weeks later, Kupp played through a painful hip pointer to catch five passes for 70 yards and a touchdown against another FBS foe, Toledo. From there, Kupp caught a touchdown pass in all but one start for the Eagles, setting an FCS record with a TD catch in 14 consecutive games. Over the team’s final six regular-season outings combined, Kupp caught 10 touchdown passes and averaged nearly 160 yards receiving per game. 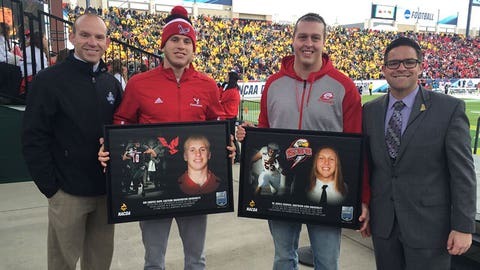 Led by Kupp, Eastern Washington reached the national semifinal for the second straight year, this time losing to Towson in Kupp’s only game without a score (he still caught eight passes for 124 yards), and Kupp finished the season as the FCS leader in receiving yards (1,691) and receiving touchdowns (21). For his efforts, Kupp was given the Jerry Rice Award as the FCS Freshman of the Year. "I don’t want to say I expected to do it, but my goals were to be an All-American," Kupp said of his redshirt freshman campaign. "And I know if I were to have that conversation with someone before my freshman year, they’d probably laugh it off and say I think too highly of myself. But that’s just how I have to operate. And then I was able to go out and achieve that, which was really cool." And while some may posit that Kupp set the bar too high in his first season, Kupp says the thought never crossed his mind. "You ask yourself, ‘What did I do my freshman year that got me to where I was able to play at such a high level?’ and then take that and try to step it up the next year," Kupp said. "So I came into my sophomore year with the attitude that I had to earn it again. By the time he was a sophomore, Kupp was no longer flying under anyone’s radar, so perhaps it came as a surprise to some that Kupp followed up his debut with a monster second season. However, that’s a bit of logic that’s lost on his coach, Baldwin. "Anyone who got to watch him day-in and day-out, they never saw a drop-off," said Baldwin, a former quarterback at Central Washington. "They saw him continue to grow and continue to do more and more and come up in big situations." Never was that more true than on the road against Washington, when Kupp hauled in eight passes for 145 yards and three touchdowns in a 59-52 loss to yet another major program that never even gave him a look. "The Huskies were one of the programs — and it was a different coaching staff than is there now — that we just couldn’t get to even talk to us," Craig Kupp said of his son. "And you know, my dad played football there, so it was quite frustrating that we couldn’t at least have a conversation with somebody. So for him to go out and do what he did out there, that was pretty neat." Kupp’s grandfather called the performance one of the greatest days of his life. From there, Kupp’s legend continued to grow, and for the season, he finished with 104 catches for 1,431 yards and 16 touchdowns — in two fewer games than his freshman season — and earned a consensus FCS All-American nod for the second straight year. 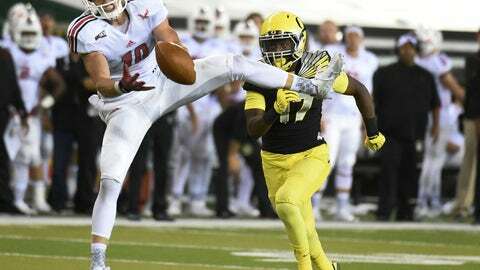 Paced by Kupp and quarterback Vernon Adams, Jr., Eastern Washington seemed poised for a national title run during Kupp’s junior year, but that plan grinded to a halt when Adams transferred to Oregon for his senior season. 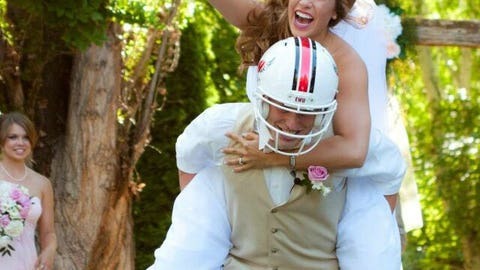 "They always ask what it’s like losing your quarterback, but really the tough part is one of your best friends leaving," Kupp said of Adams, who was a groomsman in Kupp’s wedding last summer. "You go from spending eight hours a day with your boy, you’re lifting weights or throwing or watching film, doing something together, and then he leaves, so it’s hard." Kupp said he and Adams talked several times about the possibility that Adams might transfer, with Kupp assuring Adams that the decision wouldn’t impact their friendship either way while also urging him to stay. In the end, Adams switched allegiances to the Ducks but said he wasn’t concerned about leaving Kupp hanging without the only college quarterback he’d ever known. "Pressure is a privilege, at all times," said Adams, now with the Montreal Alouettes of the CFL. "If people are putting pressure on you, that’s a privilege, and it just shows that people are looking up to you and looking for you to make plays for the team. You always want that as a star player, and I never worried about him." It was only fitting, then, that Kupp opened his junior season against Adams and Oregon — and had the biggest game of his career on the biggest stage of his life. Though Eastern Washington lost, Kupp caught 15 passes for 246 yards and three touchdowns, prompting Oregon defensive backs coach John Neal to tab Kupp as a potential first-round pick in the 2015 NFL Draft. "I had a nice talk with him and I wanted to tell him I’ve been watching his tape since summertime," Neal told reporters of his postgame conversation with Kupp. "I knew we were going to have trouble guarding him." Over his first four games last season, Kupp caught 46 passes for 759 yards and 10 touchdowns — and that didn’t even include a 20-catch, 275-yard, three-touchdown outburst against Northern Colorado. For the year, he finished with 114 catches for 1,642 yards and 19 touchdowns in 11 games and led the FCS in every receiving category of note. 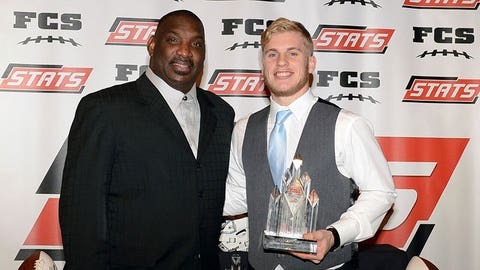 As a result, Kupp was named the Walter Payton Award winner as the FCS’ top offensive player — an honor previously bestowed on such names as Jimmy Garoppolo, Tony Romo, Brian Westbrook, Steve McNair and Dave Meggett. And then there are the records. The laundry list goes on and on, but suffice it to say Kupp has broken virtually every receiving record that exists at Eastern Washington and in the Big Sky Conference. He’s also the FCS’ all-time leader in career receiving yards per game (122.5) and ended the season on pace to set FCS marks in career receptions and receiving touchdowns as a senior. The only question that remained was whether Kupp, a projected second- to fourth-round pick, would play a senior season at all. Fortunately, Eastern didn’t have to wait long to get an answer. Eight days after Eastern’s final game, Kupp and his wife, Anna, spent a Sunday fasting and praying about the decision, taking into consideration all they’d learned about his draft prospects. The next morning, Kupp woke up with a clear decision in mind, and later that day he announced he’d be returning to the school. "I don’t want to force anything," Kupp said. "I don’t want to do something out of my own selfish ambition. I don’t want to be something I’m not, and something I’m not is someone who does something that might not be right just because there’s more money in it. I’m about relationships, the relationships with my coaches, the relationships with my teammates, with my friends." He’s also eager for the team to redeem itself after a three-game losing streak to end the 2015 season dropped Eastern Washington from 6-2 and No. 4 in the nation to 6-5 and out of the FCS playoffs altogether. It will be a tall order. 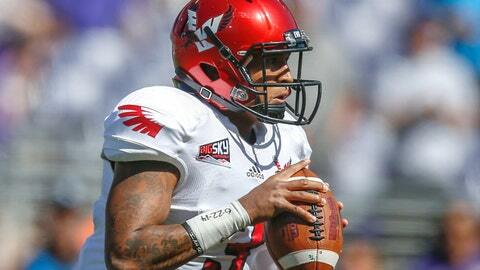 Eastern Washington — ranked No. 17 or No. 14 entering the season, depending which poll you choose to follow — opens at Washington State, then plays at five-time defending FCS champion North Dakota State, then hosts Northern Iowa, a top-5 FCS team in its own right. "That’s important to me, too, and so is being able to do this with those guys and my brother for one more year," Kupp said of his younger brother, Ketner, a sophomore linebacker at Eastern Washington. (Kupp also has another little brother, Kobe, and a sister, Katrina.) "If football is going to be a thing for me, God is going to make that a thing for me, and it’ll be there a year later." That’s a mature stance from a then-22-year-old with millions to be earned in the pros and little left to prove on the field, but from Kupp, it doesn’t come as a surprise. "I don’t see football as a profit-maximization thing," said Kupp, allowing the economist in him to come out. "I play football because it’s fun. I completely understand that football at the next level is a business, and I want to provide for my family as well, but I’m not about the excessive lifestyle, I’m not about living extravagantly. "If God’s going to bless me with the opportunity to play this game," he added, "I’m going to do it because I love it and because I was made to do it." Barring some sort of catastrophic injury, it’s a virtual certainty that Kupp will get a chance in the NFL this time next year. The question now is whether he’ll be able to make as much of that opportunity as he did of the one at Eastern Washington. Considering the last four years, though, it would seem unwise to write him off as just another flash in the FCS pan. While many FCS greats do go on to succeed in the pros, there are far more who don’t. Terrell Hudgins, the former Elon wideout whose career receptions and receiving yards records Kupp is poised to break, made a brief appearance in Cowboys camp in 2010 but was virtually never heard from again. David Ball of New Hampshire, for now the FCS’ all-time leader in touchdown catches, popped up in a couple NFL camps and bounced around the CFL but never amounted to more than a practice squad fill-in. But the coaches who have faced Kupp over the last several seasons see plenty of reason to believe he will not only be a pro, but a good one. "I think fans from the Pacific Northwest will recognize him as the second coming of Steve Largent," said Idaho State coach Mike Kramer, the only other college coach to offer Kupp a scholarship. "He’s actually bigger than Largent was, but when Largent put his helmet on, it was not the Steve Largent that eventually became a U.S. Congressman. It was not the great guy that everybody thought of. He was a mean, vicious, wicked competitor, and Cooper Kupp is nothing less." Portland State coach Bruce Barnum also compared Kupp to the longtime Seahawk and 1995 Hall of Fame inductee. "He’s fluid, he’s a great route-runner, and he’s got exceptional hands," said Barnum, the 2015 Big Sky Coach of the Year. "Every team is different with what they do offensively, and when he gets that opportunity in the NFL, I think he’ll be looked upon differently by each team. 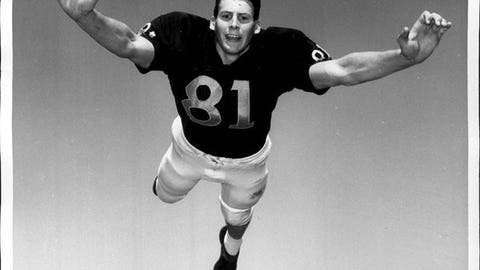 Some like guys who run faster than a speeding bullet, and some want Steve Largent. He’s a cross between the two, and I’m guessing you’ll see Cooper Kupp play a lot more years of football." Northern Colorado coach Earnest Collins, Jr., against whom Kupp had the best game of his career so far, said he expects Kupp to emerge as "the next great slot receiver in the NFL." "I think the thing that he’ll have that Wes (Welker) and (Julian) Edelman don’t is that he’s got size," Collins said. "He’s 6-foot-2 and I think he’s going to be phenomenal. He just has a special talent that’s kind of rare. And you can say, ‘Well, he’s doing it against FCS talent,’ but he did it against Oregon too. It’s not like he’s just torching lower-level talent. He’s torching whoever he comes up against." During Kupp’s career, he’s only been held under 50 yards receiving twice, most recently against Cal Poly last season. But even Tim Walsh, the Mustangs’ coach, admits there’s no secret to stopping him. "We played the entire defense on him," Walsh said. "If we were going to lose, we didn’t want it to be because Cooper Kupp beat us, and to me that’s the ultimate compliment you can give a player — that he alone is capable of winning the game. Predictably, Kupp’s own coach is also firmly in his corner. "If he was in the NFL this fall, I think he’d catch 90 balls — I really do," Baldwin said. "He’d do it on just about every team, and if you use him in a certain way, it might be 100 in a 16-game season. I see him being a high-volume guy, even at that level. "People always say he’ll be a slot, but I argue that a little bit," Baldwin continued. "I’m not saying he’s not a great slot, but I don’t think he’s pigeonholed into that, either. I think he can go out there and win against NFL corners, too. I believe that. He has the versatility and the intelligence to move all around in an offense. He always has, and I don’t see why that would change at that level." As is his best friend and former quarterback. "Quote me on this: Cooper Kupp is the best receiver in the country right now," Adams said. "No DB in the country can guard Cooper Kupp right now. I played at Oregon, and we had some great receivers there, but Coop is the best receiver I’ve ever played with. I’ve never seen anybody work like him. I’ve never seen anybody, on game day, come alive like him. "He should go in the first round this year," Adams continued. "I’m sure the scouts want to see him run under a 4.4, and he’s going to have two to three months to prepare for that, and I guarantee he runs underneath a 4.4 and goes in the first round." But perhaps Kupp’s most ringing endorsements have come from the pros who helped raise him. Both his father and grandfather said they were surprised by his decision to stay in school, and both are looking forward to big things from him once he finally does move on. 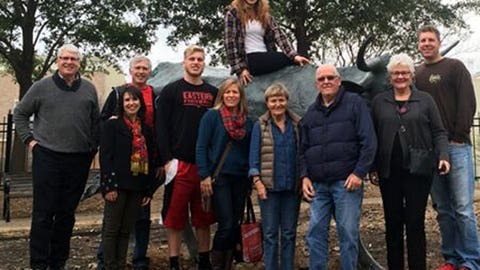 "It was exciting for me, when I went through it, to be able to share that experience with my dad, and to be able to talk to him about his experience and that type of thing," Craig Kupp said. "And to be able to have that, now, with Cooper — gosh, what a cool thing. It’s a pretty rare deal, and it’s a blessing, and we’ll keep our fingers crossed that it happens and that we can all experience that together." "This is very, very selfish on my part, but my wife and I, we travel, we went to all the games last year, and I just can’t imagine what it will be like to be able to watch Ketner on Saturdays then hop on a plane and go off to some NFL city and watch Coop play the next day," Jake Kupp added. "Life couldn’t get any better than that. "I also kind of have an understanding what he’s going into, but he’s in a whole different league from me," the Saints’ Hall-of-Fame inductee continued. "I was basically a journeyman player, but Coop is a couple levels above what I ever was, and I think he could be one of the very best." Not surprisingly, Kupp has higher expectations for himself and says his goal is to be inducted into the Hall of Fame. But at the end of the day, the best player you’ve never heard of is also among the most humble and will be satisfied with whatever happens after his unexpected — but statistically predictable — rise to the top of the college football world. "If I’m a coach and I see someone who can play, I’m not going to say, ‘You don’t fit the mold,’" Kupp said. "If you can play, coaches in the NFL want those players on the field. They want guys who know the game and love to compete. So I think there’s a place for me. "Success in my mind is, when it’s all said and done, are you happy with what you did? " Kupp added when asked how he’ll evaluate his career whenever it finally ends. "And if I walk away knowing I did the best that I could possibly do, then I’ll be happy with myself. However long that ends up being, whether it leads to me being a Hall of Famer or not, I’ll walk away feeling like I was successful."